NEW: What is Mello? David Stredder explains in this video. Videos of some Mello Monday presentations (since June 2015) are at PI World. Mello Monday. Dinner at Sea Salt restaurant or Burger & Bubbles Bar on the third Monday each month (except July & August). It typically starts around 6:30pm for drinks with presentation(s) at 7pm and dinner at 9pm. Times vary and reservation required via David Stredder or ShareSoc. Do not contact Sea Salt. Workshops & conferences. Held a few times a year: So far we have held a three day Mello 2014 event with general investor talks and company presentations plus a two day Mello Workshops event. 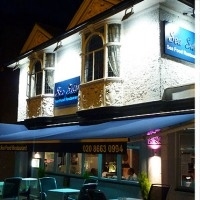 Sea Salt: 2 Southend Road, Beckenham, BR3 1SD. Opposite Beckenham Junction station. 16mins from London Victoria. Burger & Bubbles: 1-4 Southend Road, Beckenham, BR3 1SD. By Beckenham Junction station, opposite Sea Salt. 16mins from London Victoria. Set menu + inclusive bubbly. FinnCap: 60 New Broad Street, London EC2M 1JJ . A short walk from Liverpool Street station/tube. Contact David Stredder (aka Carmensfella) by sending an email with 'meeting' in the Subject Line to mellomeet@gmail.com (a spam filter will discard emails without the word 'meeting').